Walt Darran (1940-2013) truly embodied the Aviator pioneering spirit and continued to be active in the international aerial firefighting community right up to his untimely death in 2013. 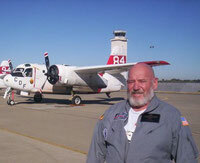 After nineteen years seasons as an air tanker captain, Walt finally retired from flying aerial firefighting missions in 2009 and took up the mantle of President of the Association of Aerial Firefighters, now known as the Associated Aerial Firefighters (AAF), committing the last decade of his life to promoting training and improving flight safety for aerial firefighting pilots. Over his 48 year professional pilot career he achieved 17 type ratings and flew 25,000 hours with 1500hrs on helicopters. He had an aviation career and life that most pilots can only dream of, and one that would be hard to duplicate today by the most ambitious pilot. In the early 1960s he joined the United States Navy and he checked out on the Douglas A-1 Skyraider taking part in two combat deployments to South East Asia as a carrier-based attack pilot. Lieutenant Walter W. Darran, Jr., was awarded the Distinguished Flying Cross for extraordinary achievement while participating in aerial flight as wingman on a combat rescue air patrol on 10 September 1965, conducting a search at extremely low altitudes in the face of intense enemy fire. After leaving the US Navy Walt joined Air America and did initial flight training in Thailand but, as operations were winding down, he soon jumped ship to Continental Air Services to get into the STOL (Short Take-Off & Landing) programme flying the Pilatus PC-6 Porter in Laos. It was here he met air tanker pilots who at the time were being hired away from jobs in the states to fly covert operations. It was these pilots who eventually encouraged him to return to the USA and join the aerial firefighting flying community. In 1971 he landed a co-pilot seat in a Consolidated PBY Catalina airtanker at Hemet Valley Flying Service. Since they had lost a couple pilots to accidents the year before they also checked him out in the TBM as a spare pilot when he started. Fortunately for Walt a fellow Hemet Valley TBM pilot decided to buzz a drag strip during a race and the boss happened to be in the stands. The next day Walt was a Tanker Captain, even though he had never been to a fire before. Walt went on to fly nine fire seasons in TBM’s, Martin B-26 Marauders, Grumman S-2A’s, Fairchild C-119 Flying Boxcars, Boeing PT-17 Stearmans, and PBY Catalina amphibians. Walt explains, “Fireflying was great back the 70’s but the money was horrible, about $10,000 a season was the average in 1976 and a lot of guys were getting killed. Perhaps it was the lack of safety which made Walt broaden his horizons in 1979, and he signed on as co-pilot on a Boeing B-737 for AirCal and thus began a twenty year airline career. In 1987,AirCal was Beoing B-737, McDonnell Douglas MD-80, DC-10, and international Airbus A300-600R. He took mandatory retirement at age 60 in 2000. 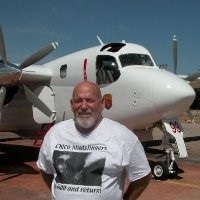 Not wanting to put his feet up, in 2000 he got a job flying single engine Ag-Cat air tankers for Downstown Aero in New Jersey and in 2001 was hired to fly the Grumman S-2A for CDF Calfire eventually transitioning to the Grumman S-2T.